Ask yourself, enjoy the scenery and enjoy an intense moment of calm! Casa delle lucertole has restored "Casa Colonica" (farmhouse), is set in a single hill top position in the untouched Le Marche Region. Changing light and sky THROUGHOUT the day Granted stunning views over valleys and hills. 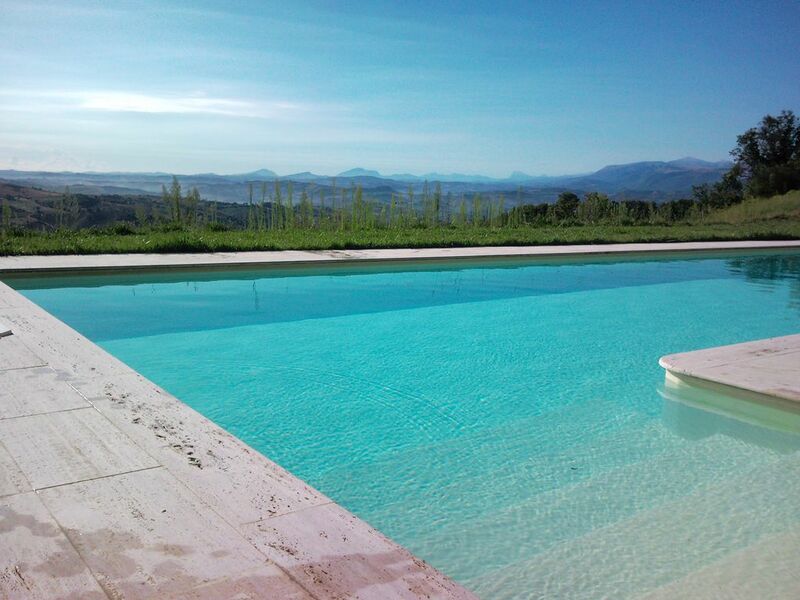 Its 4 hectares private land insures a amazing peaceful environment while the 15m long pool allows a real Good and relaxing swim. In according with this true natural atmosphere, the renovation of the house has-been the carried out in order to Maintain the walls of the old "casa colonica" and to assurer a comfortable stay for 2 families (11 people, 5 bedrooms). Ground Floor ("permanent old"): Open wide fully equipped modern kitchen, dining area and a seating area equipped with Hi-Fi. An independent twin bedrooms with en suite bathrooms (large shower + toilet). First Floor: a double-bedrooms with en suite bathroom (shower + bathroom + WC) and a large dressing room, a large double bedrooms with en suite closet (toilet and sink), a small children's room with 3 beds (2 bunk beds) Reviews another children's room with 2 beds, an independent WC and a bathroom. Nature lovers Will Be impressed by outstanding beauty of the Sibillini mountains nearby (1h1 / 2 drive), Many trails Within 10/20 min drive or pilgim the ancient route to Assisi passing through the hamlet Itself. Art lovers Could go to famous places like Urbino, Perugia, Assisis Within 2hours drive, goal Will certainly discover the medieval town of Cingoli, Known as the 'Balcony of the Marches' or the town of San Severino Known as 'City of Art' ( Both 10 mins drive) ... and many more (Ascoli Piceno, Fermo, Macerata, Loretto). Music lovers can plan delightful evening at the openair opera of Macerata. Food lovers Will enjoy great local osterias with wine at very good prices. Sun lovers Will run to the Adriatic coast: Senigalia, Sirolo or Porto Recanati. Finally shops lovers Will Get Good bargains in nearby Outlets (PRADA, GUCCI, TODS ...)! Very well equipped, exceptional views + quietness. The house is simple, with a well equipped kitchen and everything one requires for a quiet holiday in a beautiful landscape. The pool is very well designed and the view from it breathtaking. The location is remote and we might have been the only non-locals around other than our neighbours whose house was in no way intrusive on our sense of solitude. Highly recommended. Une magnifique semaine au cœur des Marches !!! Nous avons adoré notre séjour dans ce superbe endroit. La vue de la piscine est à couper le souffle et la piscine est super agréable, de même que la maison. Celle-ci est bien équipée et vraiment aménagée de manière à pouvoir être à l'aise à plusieurs familles. A recommander sans hésiter !!! Beautiful view from the house. Quiet and private. Friendly, helpful people. The location of the house is high on a hill, making days less hot than in other areas. everything to make your holiday a success! Quiet, wonderful view, nice home and large swimming pool: everything to make your holiday a success! Une superbe maison.... Nous avons apprécié le calme, la piscine, les balades dans la montagne, les villes aux alentours....et une journée à la plage. Des vacances excellentes avec toute notre famille jeunes et moins jeunes... On vous conseille la pizzeria del forro! Merci et je l'espère à bientôt pour un nouveau séjour à la "casa delle lucertole" pour découvrir cette très belle région des "Marche"! Discount for second week Refund Security Deposit (caution remboursable) = 30% of rental cost Prices may be subject to change at the advertiser's discretion Supplementary charge will be made for any additional services such as daily cleaning and laundry or supply of a cook. Guests staying during low season periods when central heating is used will be required to pay a gas supplement based on usage.